PVC Materials are resistant to acid, alkali and corrosion and do not rust. They are self-extinguish and flame-retandance materials and does not aggravate combustion and can extinguish easily. They have good anti-aging ability and can be used for 30 to 50 years under temperature condition of 15-60 ℃. The inside of PVC pipe is sleek and its wall tention is small and difficult to scale and its fluid transmission capacity is 43.7% higher than cast iron pipe. PVC materials are resistant to water pressure, outside pressure and impact strenght. 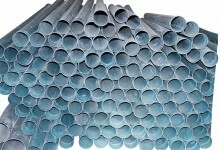 Whether you use loop junction or TS junction ways to connect, PVC pipes doesn't leak water and it is applicable to all kind of piping project at normal temperature. Click the button below to add the PVC Pipe (5mm) by 12ft to your wish list.